There are many notable Gibsons. Guy Gibson the second world war dambusters hero, Debbie Gibson the 1980s American pop starlet, the cherry red Gibson SG guitar as popularised by Tony Mcphee once of early seventies power trio The Groundhogs and there’s also William Gibson visionary science fiction author. 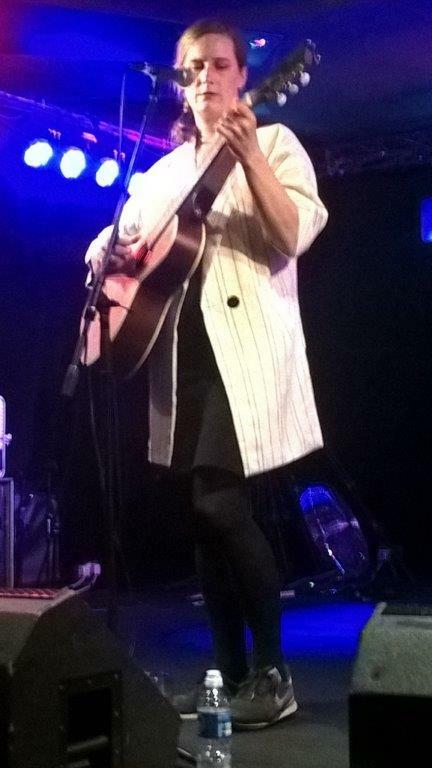 Here’s another for the list, Laura Gibson, a singer-songwriter of considerable talent. This Gibson hails from way out west in Oregon and now fresh from last weekend’s appearance at The Greenman Festival she is in the small convivial confines of the Leicester Musician – a great little boozer and the place where we saw a devastating set years ago from John Grant with Midlake before the accolades and awards. Laura is now signed to groovy hip label City Slang and she’s on her third album. The latest is called Empire Builder, which references her journey on a train of that name and is sadly not a searing indictment of colonial Britain in the 1800s. The album itself contains some beautifully executed accompaniments. But tonight she is performing solo. Just her with an acoustic guitar, some wine and a hushed crowd sitting at candle lit tables. It’s all very atmospheric, apart from me rustling a packet of Mini- Cheddars every five minutes (sorry Laura). The album is played almost in its entirety and in the same running order. On the second number she delightfully apologises for repeatedly using the word damn in Damn sure! As if anyone in Leicester would be offended! Not Harmless, the title track, The Search for Dark Lake and The Last One whizz by in a blur of concise and absolute beauty. Two Kids is so catchy and upbeat you could almost see it as a chartbound single. When Five and Thirty makes an appearance I automatically elevate this gig to one of the best of the year. The dictionary definition of ‘pure’ goes as follows…flawless, perfect, genuine, authentic, undiluted, real and actual. Gibson’s vocals elicit all these emotions. She even drops in a John Prine cover Everyone Wants To Feel Like You, which was sublime. As for Louis, well you could have heard a pin drop (or a mini Cheddar ). Supporting tonight were Les Hayden, a long-haired lad who looked not unlike a young Steven Wilson from Porcupine Tree and sporting a Slayer t shirt. He played all his own compositions, and very nice they were to. The best one, Witches, contained the oft neglected word “apex” which won him over in my eyes. We also enjoyed Melanie Page from just up the road, Loughborough. Playing some lovely guitar with flamenco flourishes and singing her lovely songs with a kind of Joni Mitchell phrasing. It was all jolly good stuff and both are recommended listening. For more information about Laura Gibson, visit here website here. 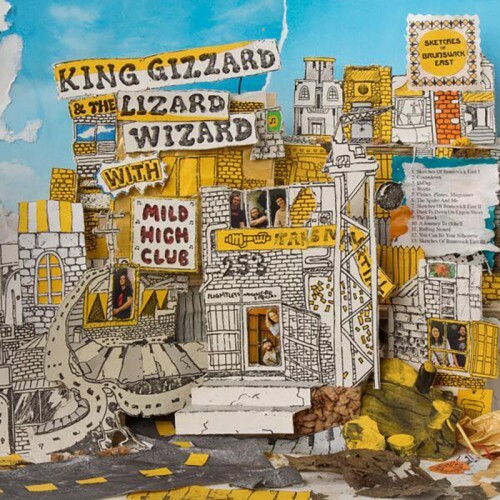 One of the hardest working bands in music – Australia’s King Gizzard and the Lizard Wizard – are now over the half way mark in their hectic schedule of releasing five albums this year. Exponents of psychedelia, rock, pop, jazz, you name it, this third outing of 2017 sees them team up with mellow 70s nostalgist Alex Brettin, aka Mild High Club. The result is part jam session, sounding improvised at times as they seek to capture studio spontaneity. But it is also a seriously well constructed blend of all their styles. What emerges is the best, and possibly only, eclectic psychedelic lounge album you will hear all year. For example, on D-Day, one of many short instrumentals across the album, King Gizzard and Brettin move seemlessly from funk to a Marrakech bazaar backdrop. This almost demands the invention of a time machine to provide a ready made soundtrack to an early 1970s Bond film. There’s also early hours club sounds aplenty on the rampant A Journey to (S)hell. In addition, there is lashings of pop too – with the radio-friendly The Spider And Me and Countdown particularly standing out. Brettin has done a fine job honing the 1970s sounds across this album and this is clearly a collaboration borne from mutual respect and one that will hopefully continue with further releases. For those who have only heard King Gizzard’s heavier rock albums this may jar. But by now most who are familiar with the band should know that they can’t be so easily pigeon holed and are always willing to surprise their listener. As well as being one of the hardest working bands around King Gizzard continue to be among the most interesting recording acts. 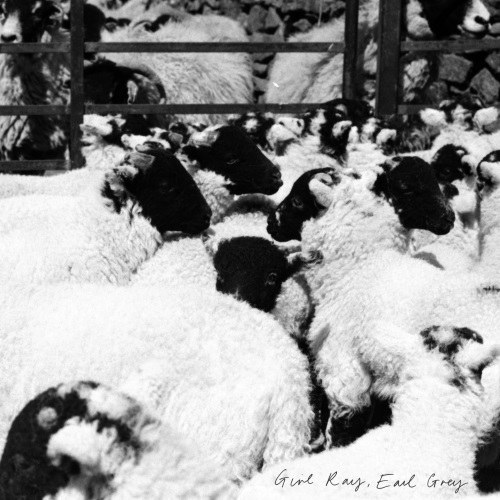 This album, with Brettin bringing extra class to proceedings, is no exception. It has been at least two months since my last dispatch from the Flaming Lips tour, so this latest review is well overdue! On that occasion it was a mad night in Manchester, tonight a visit to the not very car friendly Birmingham (whose city motto appears to be ‘road closed’) is called for. The astrological signs were perfect. Virgo was in Uranus, there was a lunatic in the Whitehouse and it was the height of the hemorrhoids meteor shower. The conditions were ripe for some psychedelic shenanigans with The Flaming Lips. 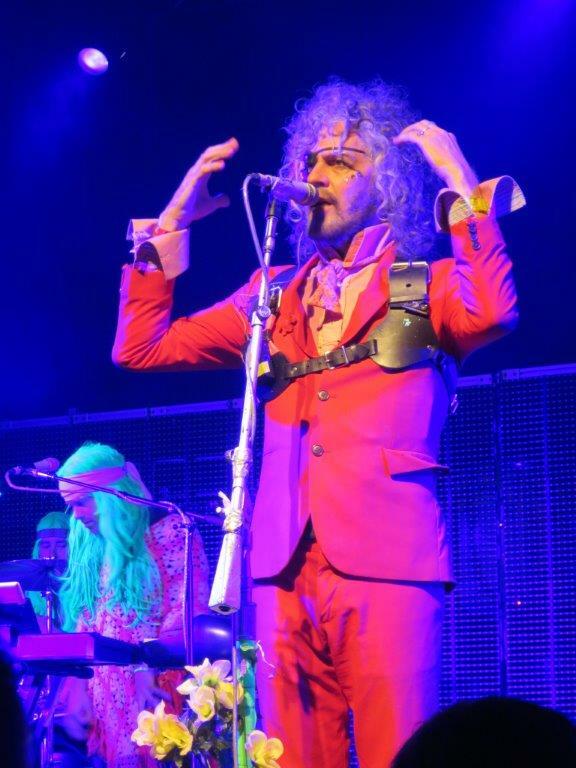 Bearded Jesus lookalike and all round groovy guy, Flaming Lips frontman Wayne Coyne, is treated like the messiah. “We love you,” shout the faithful as he prepares the band for orbital insertion. The stage is set for another acid pantomime – where’s the evil giant pink robot? He’s behind you! The keyboard intro for the opening number, Race for the Prize, now surpasses the five minute mark as it builds the tension. We space cadets are ready and primed then BAM! 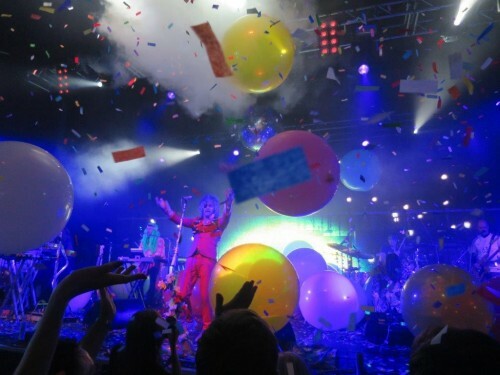 The academy explodes into a multi coloured explosion of light and confetti as this track kicks off the gig in a blitz of ecstatic sing-a-long joy. For the next ninety minutes we scream like teenage girls at a Beatles gig. We laugh at the budget unicorn as it makes its wobbly way around the crowd, Wayne astride it laughing and singing. Wayne gets in the inflatable hamster ball for a cover of Bowies Space Oddity. Two giant eyeballs on legs go-go dance either side of the stage and we sing happy birthday to a girl called May. I then witness J Wilgoose from Public Service Broadcasting hanging off the balcony laughing and shouting down at Coyne on the unicorn. I look around and a girl who has never seen them before is grinning from ear to ear, a complete stranger kisses me during A Spoonful Weighs A Ton, and How? from the new album reduces me to an air punching crying lunatic. It’s all in a days work for these guys. But every time it’s special and unique – an almost spiritual occasion and the camaraderie at a Flaming Lips gig is like nothing I have ever witnessed. You will leave with new Facebook friends, a camera full of wonderful memories and a feeling of optimism that verges on the obscene. Then they do Do You Realize. As the massed happy throng sing this desolate yet beautiful song at the top of their knackered voices the band send out telepathic vibes of universal love to send us on our way. They then disappear back to whatever planet they come from. 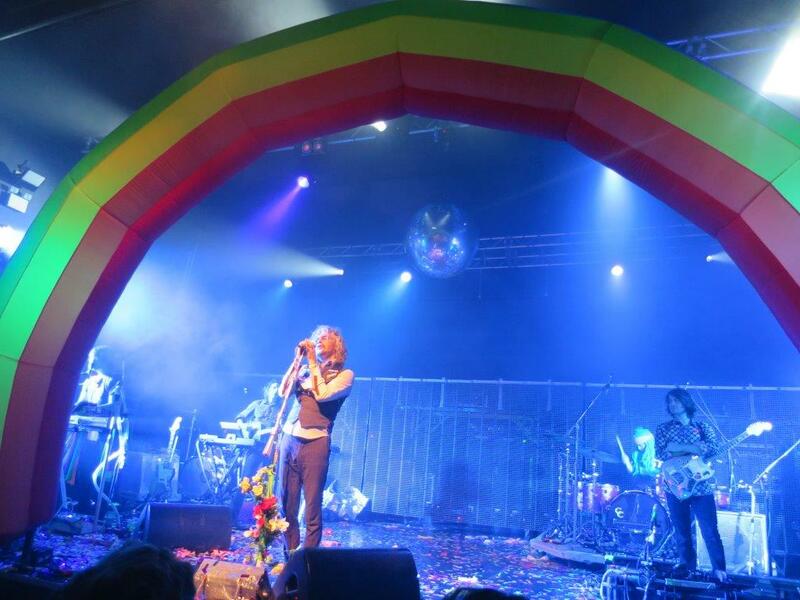 The Flaming Lips ‘ support tonight came from Amber Run (don’t worry, not the Home Secretary Amber Rudd), who are a Nottingham band of fine distinction. They play epic rock tunes that would make Springsteen jealous and have a frontman in Joe Keough who looks like Neil Young circa Tonight’s the Night. He sings like a fucked up angel and is quite the best vocalist I’ve heard for ages. Their tunes are memorable and the execution riveting. At one point Joe mentions they were on the point of packing it all in, seeing no money and no girls they contemplated calling it a day but judging by the crowds vociferous and appreciative reaction this should be considered a criminal act. 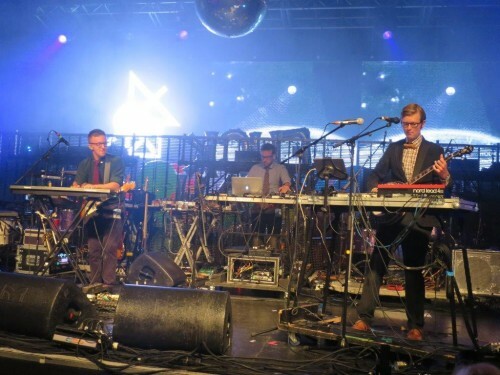 As for Public Service Broadcasting, what can you say about a band who have been into space, piloted a Spitfire climbed a mountain and now descended into a Welsh mine. The band is now fleshed out with an extra guitarist and three guys on brass, one of whom thinks he’s in the James Brown band. They look like teachers in a 1970s school staff room, All suits and ties, but they really rock. With a simple but effective back projection of images and cracking, albeit difficult to pigeonhole, tunes they are a must see/must hear innovative live experience. Right, now how do we get back on the M6?